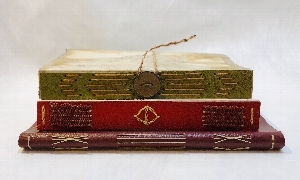 Sat, March 9, 2019 10:00 A.M.
Called long-stitch because of the long stitches visible on the spine of the book, this non-adhesive binding technique dates back to the Middle Ages. Participants will be taught the basic sewing technique and will make an all-paper model that they can take home. The class will be taught by Karen Lightner who just retired from the Free Library of Philadelphia, having served as head of the Art Department for the past 10 years. She has been on the Board of Philadelphia Center for the Book for several years and is a member of the Guild of Book Workers. She studied Photography and Book Arts at Visual Studies Workshop in Rochester, NY and earned an MFA there in 1981. The Art Department partners with the Philadelphia Center for the Book to bring free book arts workshops to Parkway Central every month from September to May. Space in these very popular classes is limited; please let us know in advance if you will not be able to attend after you have registered so that we can release tickets to those on the waiting list.